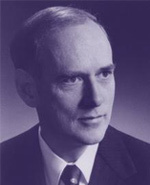 (1977-1984) A native of Saskatoon and a fellow of the Royal Society of Canada, Dr. Connell earned his PhD in biochemistry at the University of Toronto, where he eventually served as associate dean of medicine, vice-president of research and planning and chair of the university's budget committee. Upon his arrival as Western's sixth president, he began restructuring the administration to group responsibilities and enhance managerial efficiencies. He helped create a sense of Western's corporate identity as an institution with a dual commitment to both teaching and research. Admired for his academic leadership, Connell also developed strong relationships with the Senate and Board of Governors while adjusting to a time of declining government support. He actively campaigned within the community for help and developed alternative funding sources during a time marked by financial restraint and uncertain student enrollment. Connell also served on the Fisher Committee that produced a report on the future role of Ontario universities before returning to Toronto in 1984 to assume the presidency at his alma mater. Dr. Connell died March 13, 2015, at which time the following tribute was published in Western News.